Like previous Starter Sets, the box contains everything that 2 players need to get started playing Dice Masters. There are 24 Character Cards (8 characters with 3 cards each) and 10 Basic Action Cards. Each character comes with 2 matching dice. There are 12 Basic Action Dice (3 dice of each color: Brown, Pink, Purple, Orange) and 16 Sidekick Dice. A paper copy of the rulebook and 2 paper dice-bags are included to get you into the action immediately. The first thing you notice when looking through the cards is that the presentation level has been increased in this set. The card art is amazing throughout! But there are also a few smaller touches that improve the overall aesthetic. The plain grey borders of previous sets have been replaced by patterned gold, the banners to denote affiliation are a great thematic touch, and the die cost background is color-coded to match the alignment of the card. The dice also appear to be of a similar high quality, with only a couple of minor paint finish problems noticeable. For a lot of people though, it is the new card abilities that they will be most interested in. Battle for Faerûn introduces 7 new shorthand card abilities, and 4 of these can be found within the Starter Set. The Blue Dragon and Green Dragon have Breath Weapon attacks that can be used to deal damage to your opponent and all of their creatures. The Halfling Thief and Human Paladin gain Experience when they knock out a monster, making them stronger. Trolls can Regenerate (reroll when knocked out), and Vampires can Energy Drain to spin an engaged character down one level. We really like that WizKids has put these abilities into the Starter Set, as it will show new players the depth of options and strategy that might become available to them in the future with more cards from Expansion Packs. There are a nice mix of Basic Action Cards, including the 2-cost Stinking Cloud that will be great against Sidekick heavy teams, and the first ever 5-cost BAC: Finger of Death, which guarantees the removal from the field of any character, if you can roll either of the burst faces. Also included in the box is the Expansion Pack Checklist, listing all of the cards that will be available from Gravity Feeds. We know a lot of people are interested in seeing this list, so here it is! We are really excited by the possibilities in this set, and cannot wait to get it onto the table for a game. If you are in the 'Superhero Only' camp, we encourage you to read the rulebook, and investigate the mechanics in this set. 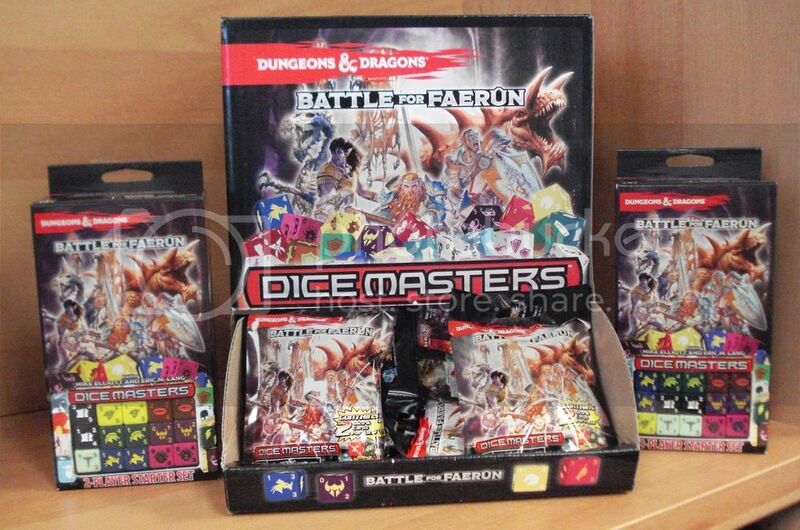 You may well be missing out on a lot of Dice Masters fun by not including this set in your collection. Check out this video review of this game changing set.